In an exclusive ExopoliticsTV interview with Alfred Lambremont Webre released June 15, 2011, author and hermeneutics expert Peter Kling has stated that Prince William, Duke of Cambridge, embodies the entity known as the “Antichrist,” to be the future king of a one world government now promoted by the New World Order. Under this analysis, the present United Nations is under time schedule starting in 2013 to be morphed by the Illuminati hidden power structure into a dictatorial, police state “one world government” over which Prince William will be installed as Head of State and King of the world. Peter Kling’s revelations that Prince William is the historical Antichrist is congruent with the revelations of Michael Prince (aka James Casbolt), an active duty whistleblower trained to be a cyborg super soldier assassin in SS and MI-6 U.K. intelligence networks. Mr. Prince has stated that World War III, a war between hostile extraterrestrial civilizations and the human civilization has started. Armed hostilities between human forces and hostile extraterrestrial forces are now taking place frequently, Mr. Prince states. Humans allied with the Grey/Reptilian Military Industrial Extraterrestrial Complex [MIEC] are concurrently preparing a false flag ET invasion, Mr. Prince stated. The negative extraterrestrial-human alliance intent on Earth take-over is referred to as the Military Industrial Extraterrestrial Complex. 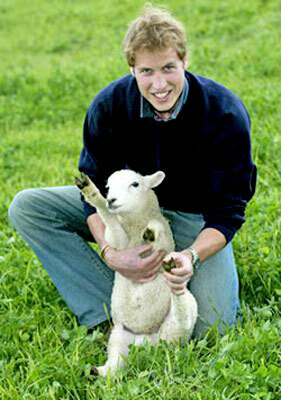 Read "WWIII - A War Between Hostile ETs and Humanity, Has Started..."
A formal photograph (Exhibit A below), officially released by Buckingham Palace and published on May 31, 2004, depicts Prince William posing in “popular” garb (blue jeans and sweater) with a lamb as he holds its rear cloven hoof is an example of an officially-sanctioned intentional communication by the U.K. Throne from Prince William as the Antichrist, future king of the one world government. holding lamb's hind cloven hoof (Baphomet symbol). The Antichrist Crest (Windsor family crest). Lion is the Lion of Judah. In 1948 the Star of Molech (same as Star of David, adopted as the Zionist flag at the Zionist Congress of 1897) flew as the Flag of Israel. After 2 world wars, millions dead, the 'Holy Land' had been captured once again, by worshipers of Molech. “On May 31st 2004, the Rothschild-controlled Associated Press, published a photograph world wide, taken by Alistar Grant. 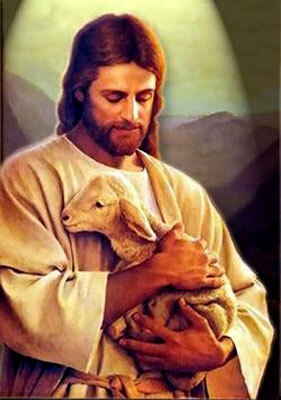 The photo shows prince William posing with a lamb like Jesus Christ, who the Bible calls the Lamb of God. What is the significance of this photograph? To the unaware observer, the photograph is perfectly innocent. But to insiders familiar with the Protocols of Zion, Freemasonry and the Book of Revelation, William is identified in the photo as the antichrist. “The antichrist has been described in art and literature as a handsome and charming and a master of lies and deception. Freemasons call him the Baphomet, or Goat of Mendes. He is commonly illustrated with cloven hind hooves. “The truth is that Exopolitics was replaced by Religions, by the Sumerians, with the Kingdom of Nimrod. The recorded evidence before that time, shows the humans knew who the Alien life forms were and who it was that was interacting with them, some Aliens becoming their daughters husbands. “The Dogma in Religion has no basis in the Bible, the basis for almost all religion comes from the teachings of the Sumerians who were taught by the Anunnaki, that humans should worship them as gods. “In reality the Bible is more a book of Exopolitics, then it is a book of Religion, because it explains the Alien involvement in human affairs from before the time humans were genetically engineered, into the future when we will have our DNA repaired and are welcomed into the Multiverse as the youngest of the "God Family", the Family of Yahweh. “The term Anti-Christ is anything against the Christ. As a group the Anti-Christ are the Zionist. They were in power in the First Century, controlled the Jewish High Court and were looking for a King to drive out Rome and make Israel a world power. The House of Windsor has Hebrew roots and can be tracked back to First Century Israel and the House of Judah. The Lion of Israel, is the Lion of England. The House of Windsor as all European Monarchy has Hebrew roots and is under control of the House of Rothschild "the money changers" who are the foremost Zionist and creators of the State of Israel, known Luciferians and the 13th Star Family (self appointed Anti-Christ and leader of the 12 Families, as Jesus was leader of the 12 Apostles). “The evidence shows that the life form we know as Jesus, had a pre-human existence and used the name Michael. Jesus did not promote a new religion, he promoted a new government, one which he would be king of. That government covers all the Multiverse. Never once did Jesus ever promote a new religion. Even when teaching the "Lords Prayer" he said, to ask that "God's will be done in Heaven and upon the Earth", "the Multiverse". According to Revelation chapter 12 "Michael" (Jesus) wages war against the "Great Dragon" and drive him and his army from the "dimensions of heaven", the other 7 dimensions which exist beyond our 3D universe. “I did not get into Bible prophecy that much and stuck to the historic indications. I did not get into President Obama and his connection, simply because I did not want to side track the issue. To place President Obama in a prophetic role to the Antichrist, he would be like John the Baptist to Jesus, they were cousins and John started getting the Nation of Israel ready for Jesus. John was expendable, after Jesus was baptized and "approved" by God. How that plays out in the future will depend on how expendable the President is after the New World Order is established. “I went into a little greater explanation of the Exopolitical view of Jesus words. You forced me to do something I had not really done before, contemplate the Christian-Greek scriptures from a Exopolitical view point. In actuality that is exactly what it is! Jesus was King designate of the Multiverse from 33 until 1913, in 1914 he became King of Kings and took command of the Armies of the Multiverse and went to war, as recorded in Revelation 12:7-12 Jesus is using his pre-human name Michael, which means "Who is like Yahweh" (God's Mini Me). “From the time of the First Century and the start of Christian Movement, there was a foretelling of an element which would cause divisions, “Oppressive wolves… speaking twisted things… drawing away the disciples after themselves”. Indeed by the start of the Second Century the Christianity had fractionated into several different sects. “It was the Apostle John who recorded the information on the Antichrists, yes there is more then one Antichrist, according to the Apostle John. The term Antichrist actually means anything or anybody who is against the teachings of Jesus Christ. Those teachings were really very simple, Jesus’ basic message was Love God, love your neighbor and tell other people that he was coming back to establish a “Kingdom” or “Government” here on Earth. Jesus also told his Apostles to keep the memory of his death as a memorial to him, this date is the same day as the Hebrew Passover and is held on the Hebrew month of Nisan on the 14th day. “As an element against the teachings of Jesus, the Antichrist was well established through out the Second and Third Centuries. With the ultimate affront to Christianity coming when the Rome adopted the idea of becoming Christian and married the Religion of Rome with the early Christian Church. The 'Oppressive Wolves' submitted to the wishes of Rome and a new religion was born, the Holy Roman Catholic Church. Christian names were given to the pagan holidays and for centuries there has been an Antichrist speaking in the name of Christ. “How do the prophecies of the Antichrist apply now and in the future? Who is this Antichrist who is to appear in the “Last Days” and require us to take a mark? Who is this 'Seed of Lucifer' who is to be king of the world? Is there one person who does this all by themselves, or is there more to this then meets the eye? “Before I start to answer the above questions, I want to point out one thing. The message Jesus gave, was that he was coming back to set up, or establish his “Kingdom”, this is not a “Religious” issue, this is an exo-political issue! “To identify the source of the Antichrist, we need to go back to First Century Judea, which was under Roman occupation. The political atmosphere during the time of Jesus was one of tension, the Kings of Judea were Roman puppets and the religious leaders chaffed under the puppet kings and their Roman overlords. “The mountain where Jerusalem and the Temple sits, was called Mount Zion. “I have installed my king upon Mount Zion, my holy mountain”. This had applied to King David and was also a prophecy of the coming Messiah, or Christ, who would be a descendant of King David, the Lion Cub of Judah. All of the Tribes of the House of Israel were referred to as lions, but the Tribe of Judah and Gad were singled out and prophetically compared to lions. “When Jesus road into Jerusalem in 33 CE, the people wanted to make him king and lead a rebellion against Rome and make Israel a world power. A man who could heal the sick, raise the dead and feed thousands with a few fish and loaves of bread, would be a great tactical asset in any military conflict. However Jesus said his Kingdom, or Government, was not part of this world. Those First Century political and religious activist were pro Zion, or Zionist and had no use for a man who’s Kingdom was not Israel, so they 'killed' Jesus as a common criminal, on the charge of sedition. “The true face of First Century Zionism was shown and recorded in the book of Acts 7:42-43. Before they have him taken outside the city and murdered, the Disciple Stephen, quoted from the Prophet Amos and told the Jewish High Court that they worshiped Molech and the Star-god Rephan, two gods which were Egyptian in origin, hence the love of Egypt and Egyptian symbols on our money and in Free Masonry. “Quick research on Google Images, shows that the “Star of Rephan” and “Star of Molech” are the same as the Star of David shown on the Flag of Israel. 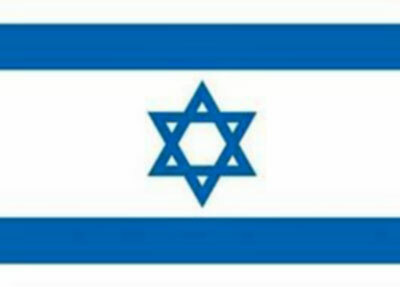 This flag was adopted as the official flag of Zionism in 1897 at the First Congress of Zion, held in Switzerland. “In the year 70 CE, Roman General Titus invaded Israel and destroyed the Zionist movement against Rome. He laid siege to Jerusalem during Passover and caught the city with almost 2,000,000 people in it. Those who did not starve to death were put to the sword, about 90,000, including the ruling class, or the elite Zionist of all Israel, were taken back to Rome as slaves. History shows that most of the Jewish slaves had purchased themselves our of slavery by the end of the First Century and had begun to assimilate themselves into European society over the years. Zionism seamed to die out and Israel was no more. “As the Holy Roman Church replaced the Roman Empire, the conquering of the pagan tribes of Europe was done in the name of Christ and the Church, not in the name of Government and Empire, but in the name of Religion. To control the Church was to control the Monarchs, hence history is rife with murder and mayhem over control of the Church and who would be Pope. “By the start of the Second Millennium, the Church and its subjects had grown in power to the point of wanting the “Holy Land” of Palestine, under Church control. A little known order of Knights comes fourth and spearheads the task. Their first order of business is to take the city of Jerusalem. Again the city is under siege, only this time there are no captives all are put to death and the Knights start digging under the Temple Mount. Who gave them the mission and what were they looking for? How did they know to look for something in the first place and where to look? “Over the next 300 years the Knights Templar became the second most powerful group in Europe only next to the Church itself. They are disbanded being accused of crimes against the church and worshiping “Rephan and Molech”, only history uses the names of the day Lucifer and or Baphomet. “The Guild of Masons did not start to become 'popular' until the start of 'The Age of Enlightenment' and for some interesting reason, the Monarchy were joining and becoming high ranking members of a 'common labor’s guild', which was now being turned into a 'Secret Society' of Royalty and rich businessmen along with what seams to be common people. “A secret society which is open to every man, by invitation only and still exist today and shapes countries around the world. The United States of America was the “trial balloon” to see if the idea behind Free Masonry would work. The idea was to run a country with out monarchs, financed by the banking industry and run by leaders of business and commerce. “The Napoleonic wars, which were financed mostly by the Rothschild Family, caused the downfall of almost every monarch in Europe, beside Czar Alexander I. It was not long after the war was over the Rothschild Banking Empire had gained financial control over the Monarchs, their countries and their economies. “In 1917 the Russian Monarchy came to an end at the hands of the Bolshevik Revolution, which was financed by the Banking Families of Europe. The end of the First World War gave birth to the League of Nations, it also opened the way for another venture into the Holy Land and the Rothschild Family started buying land from the British Government in Palestine. “The United States did not join the League of Nations, even though Woodrow Wilson wrote the Charter for the League, Congress viewed it as a European Club and after the War wanted little to do with Europe. Wilson had come under Zionist control by black mail for an affair he had which he did not want to come to light. Wilson was a supporter for the establishment of the Federal Reserve and helped sneak it through Congress, thereby dooming the United States to the debt load of over 14 Trillion Dollars to the Federal Reserve. “The Second World War saw the death of 55 Million people, it is said about 6,000,000 were Jews whom died at the hands of Nazis. It also saw the invention of the United Nations, which the United States, now a world power, was proud sponsor of its headquarters in New York City. “The first order of business was to establish a homeland for the Jews and in 1948 the Star of Molech flew as the Flag of the State of Israel, under the outcry of many Hebrew religious leaders, but to no avail the political future of Israel had already been decided at the Zionist Congress in 1897. It took 2 world wars and the death of Millions, but the 'Holy Land' had been captured once again, by worshipers of Molech. “There are not many connections I need to make between 1945 and today from a historical view point. Most of us lived through at least part of the Cold War with the USSR and were in fear of being vaporized by nuclear war. We remember when JFK was murdered and Lee Harvey Oswald was blamed. We saw the murder of Robert Kennedy and Martin Luther King Jr. The USSR died and Terrorism was born. The world was shocked into disbelief with 9-11 and we rushed to give up our freedom in the name of Patriotism and Security, only to be financially destroyed by Oil Barons and Banking Houses and a World War on Terrorism which no one can afford. “When you examine who the ‘Oil Barons’ are and who owns the 'Banking Houses', they are one and the same. Examine who owns the major shares of most corporations of the world and it is the Banking Houses. Who are the families who own the Banking Houses? We can start with the Zionist Rothschild Family along with the other ‘Star Families’ of the world. “Something which also came out of World War I, was a book, a very odd book which is said to be a plagiarized forgery. The book is “The Protocols of the Learned Elders of Zion”. What is odd is that if you had a copy of this “plagiarized forgery” in the USSR, it was an automatic death sentence. Henry Ford found it so “odd” he had 500,000 copies made and he gave them to friends and associates. The protest of the American Zionist movement almost caused Mr. Ford to loose his business, until he said publicly that he was mistaken about “The Protocol”. “Regardless of what you think, or believe, 'The Protocols' is said to be the minutes from the First Congress of Zion, in 1897. If you read it, it is like reading a blueprint for the 20th Century and it is not finished yet. What is left to happen is a series of disasters which will force the world to become all part of one system, one government ruled by one King of the World. Those who do not submit will die. “The Protocols of the Learned Elders of Zion and the Biblical Prophecies of the “Last Days” started to run together at 1914 and are now speeding up, we can see supporting evidence of this almost everyday. “Among the things to happen yet is obviously the One World Government. Revelation calls this One World Government, the Eight King. The first thing this 'King' does is turn on and destroy religion, all religion as we know it today. You may ask how this is possible. In the United States it is called Martial Law, then 'We the People' are not 'Free', we are under Military Rule. “The end of Religion would have to be caused by the ‘Ultimate’ Antichrist! That Antichrist would have to be the power behind a One World Government, it would have to be a power that could control the Nations of the World and this brings us back to the Global Elite Banking Houses and their use of Zionism as a religious-political power and money to control world events. “We have now identified the ‘Ultimate Antichrist’, how do we identify their King of the New World Order? Keep in mind that what ever events cause or force the world to chose a single government in the Image of the United Nations, will be so catastrophic, that the world leaders both political and those of industry, will all think this is a good idea and support it and the general public will buy into it, because they will think it’s a good idea. “When you understand the parameters of what we are dealing with, understanding who the 'King of the One World Government' will be, does not require too much thinking. He is here and hiding in plain sight. “This person would have to be someone who had the right to be king from a prophetic view point of the Hebrew Scriptures. In order to fulfill prophecy this king would have to be related to King David, he would have to be from the House of Judah as was King Solomon and Jesus. “It was long believed that any records which could track any of the Hebrew descendants of King David have long been destroyed, either by the burning of the Library of Alexandra, or the sacking of Jerusalem by General Titus. However, every historian will agree that Rome had the best of everything, including its library which may have come from the Library of Alexandra and now reside in the Vatican. There is another possibility which exists too. The records of the linage of the Tribes of Israel were extremely important, they were looking for the Messiah and were following the birth of the children from King David’s Line. Tracking Jesus linage back to King David can be done through his Mother Mary and his stepfather Joseph, they were both descendants of King David, hence Jesus was qualified by blood to be the Messiah. “We know that the Knights Templar dug up something under the Temple Mount, birth records could have very well been among what was recovered. There is every reason to believe the Knights Templar were Hebrew Zionist Christians, and the return to the Holy Land was well planned out. “The Templars controlled the Holy Land, until there was no money left from the Monarchs of Europe for the war against the Islamic terrorist and they had to give up. Actually the Church had to act against the Templars, or be destroyed itself. The Church was correct in accusing the Templars for worshiping Lucifer, but that is like the pot calling the kettle black. “By the end of the Napoleonic wars, England had emerged as the ‘Super Power’ of the World and the sun never set on British soil, or so it was said. 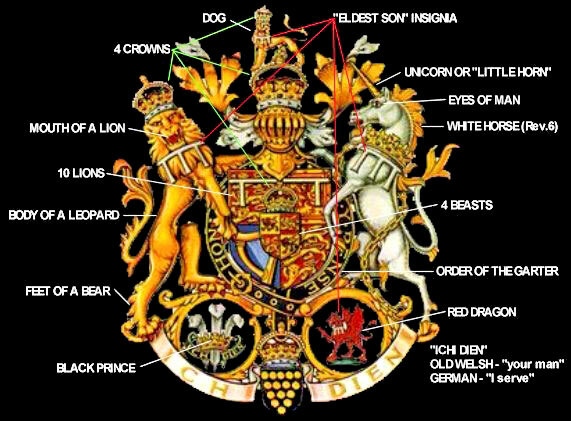 Indeed when we look at the Crest of the House of Windsor we also see the Lion of Judah, the sign of King David and his descendants. “The world so loved Princess Diana, some going so far as to call her goddess. Finally there was a woman from the Monarchy of England, who seemed to make it her mission in life, to touch the heart of the people of the world. With the public life of a Rock Star and the heart of Mother Teresa, Diana became a goddess to the world, only to have her beautiful life snuffed out in a tragic way, which broke the heart of the world. She did leave a legacy, a young Prince who is his mother’s son and her image in appearance, giving him a connection to the people of the world very few future Kings could have. “Has the goddess given birth to a god-king? In all the pomp and circumstance the Royal House of Windsor and English tradition could provide, Under world wide media coverage and the cheers and blessings of the world the Prince of the House of Windsor was married, paving the way for Prince William to be the next King of England and even King of the New World Order of the Global Elite. “Could such a beloved man really qualify as the Antichrist? Could he be responsible for death of billions and rule of terror and total submission?